Ecommerce has emerged as a monumental market presence, and along with it, the vast, destructive shadow world of hacking and digital fraud has evolved equally as rapidly. Neither of these trends should be overlooked by brick-and-mortar business owners, whose very livelihoods depend on addressing potential threats to their businesses. Unfortunately, it’s often the proprietors and managers of brick-and-mortar businesses themselves overlooking said vulnerabilities. And in an age of mobile payment processing and dynamic points of sale, it can be an expensive oversight. But it’s not that these entrepreneurs are necessarily lax or indifferent about security. It’s not uncommon for a location’s management and even risk-management policymakers to invest in robust loss-prevention strategies and institute strict check-vetting and acceptance, while overlooking one of the most common, insidious, and expensive security vulnerabilities: debit and credit card fraud. Fortunately, there are some practical steps businesses can take to greatly reduce their fraud vulnerability. Stolen credit cards are one of the most common manifestations of credit card fraud. Rather than somehow electronically intercepting card information, or stealing someone’s identity (usually), the thief has come into physical possession of the card. While thieves will often use stolen cards to make card-not-present purchases online or over the phone, many will also attempt to use them for physical purchases. Generally, this is one of the easiest forms of fraud to prevent by requiring that the clerk check the ID of the purchaser. There are two variations of dummy card fraud featuring similar scams: doctored cards and counterfeit cards. Doctored cards are popular with scammers who have actual credit card numbers but don’t have the equipment to rewrite counterfeit cards. Doctored cards are real credit cards, usually printed rather than embossed, that have had their information changed. The magnetic strip on the card is then either altered or erased so when the merchant scans the card it then fails to read it, resulting in the scammer asking that the information be entered manually. Counterfeit cards are a variation of doctored cards. Oftentimes, if the scammer has access to the technology necessary for actually printing and encoding the magnetic strip of a credit card, they will produce new credit cards written with the stolen card number. 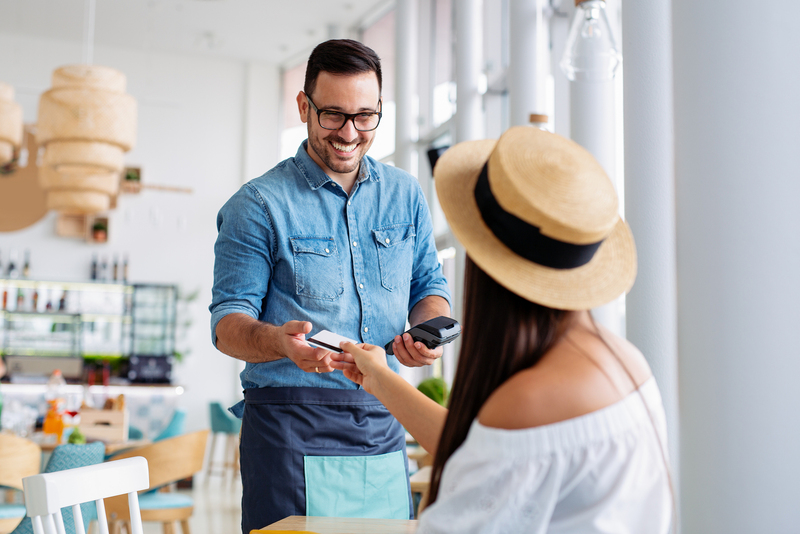 Brick-and-mortar business owners can curb dummy card fraud by ensuring their POS equipment is EMV (chip) compatible, as chip technology is much harder to counterfeit than its magnetic-stripe-based counterpart. Technology may seem like the logical place to start when it comes to protecting your business from fraud, but the reality is, successful fraud-prevention starts with people. Employee training is key. Employees are usually both the first line of defense against fraudsters and those targeted by them. Often, just a basic level of training on spotting and avoiding fraud is sufficient to significantly reduce it. The balance most businesses struggle with for card security is being as vigilant as possible without alienating the customer. No one wants to have to share their birth certificate and utility payment processing documentation to confirm their address to buy a new electronic device. But a little security can go a long way. Simply requiring customers to show an ID that matches the card and calling a manager for any card that has to be entered manually can be enough to both prevent incidences of fraud and deter future scammers. Payscout has worked to establish the company as one of the most trusted payment processing providers in the world. Facilitating safe and convenient payment solutions across six continents, Payscout has been linking merchants and consumers with credit, debit, mobile, ATM, and alternative payment solutions. Managing payments, whether on-site or across mobile and online media, is easy with Payscout. Payscout integrates with more than a dozen software applications and also offers healthcare payment processing as well as specialization in non profit payment processing. Whatever your specific payment needs, Payscout can accommodate you with quick, convenient, friendly, and secure service.